The recent chatter about an Australian republic, prompted by Treasurer Wayne Swan and Opposition minister Malcolm Turnbull, brought to mind a gilt-framed image of Queen Elizabeth II; a large portrait propped in front of the hall during my citizenship ceremony. I giggled when I saw it. In fact I had to avoid setting eyes on it for the rest of the evening, worried that I would not be able to stop. It wasn't for lack of respect, as I do acknowledge that Her Majesty is our head of state. But there was something comically irrelevant about her refined visage in that space, at that time. She had had absolutely nothing to do with my angst-ridden and protracted discernment over citizenship, nor did she feature in the application process as anything more than a footnote. In the midst of the pledging (which makes no mention of her), the singing of the national anthem ('Advance Australia Fair' since 1984), and the hand-shaking with the mayor, she stood in full regalia like an afterthought. It was jarring. In a country where over 260 languages are spoken, it bears wondering where the British monarchy sits within our self-narrative. Over half a million Australians identify as Aboriginal and/or Torres Strait Islander. One in four of us were born overseas, and a further fifth of our population have at least one overseas-born parent. Our heritage can be traced to more than 270 different ancestries. It is difficult to reconcile this reality with the monarchist mission 'to preserve, protect and defend our heritage'. Whose heritage? For what end? Monarchists argue that there's no point in fixing what isn't broken, that the constitutional monarchy has served us well. But they miss the fact that it is these very ties to a colonial past that keep us from maturing, especially when it comes to issues about race. These ties are not a form of harmless sentimentality — they are a source of enduring xenophobia and racism. I realised as much during a conversation with high school students about multiculturalism. One of them strongly identified with England, 'the motherland'. It would have been an unremarkable thing for him to say, since family histories bear it out. But he went on to declare that migrants ought to 'fall in line' with the dominant culture. He viewed Australian identity as unequivocally Anglo-Celtic and spoke of the rule of law, human rights, democracy and secularism as distinctly Australian values. The underlying presumption in his statement that migrants 'fall in line' is that they are somehow ignorant of or resistant to such values. As if people born here never flout them. I don't think there was necessarily any malice in his views. But his monochromatic understanding of national identity was a concern. It is the platform upon which people leap into Islamophobia, racism and xenophobia. It is permission to exclude. I took it as the result of a whitewashed history education that emphasised settlement, federation and two world wars. Many Australians draw lines from the First Fleet to the squatters, land barons, gold miners and diggers, to create a picture of civility and prosperity that was apparently at no expense to anyone. In this picture, Australia became what it is due to colonisation, and so therefore it must remain 'colonial' in order to preserve its existence. That is, persist in being white and Christian, ruled by a monarchy half a world away. It almost sounds logical, or at least it does to people who have latched onto political parties like One Nation and the Christian Democratic Party. But it is a fundamental denial of contemporary reality: Australia is a multicultural society — by default not by government policy — and always will be. It is one of its defining and stellar qualities. An Australian republic would validate this reality, though not at the expense of its colonial history as monarchists believe. The past is fixed, so nothing gets lost in relinquishing the legal and symbolic ties that bind us to England. There is no denying that our nation was forged by men and women who settled here from different parts of the United Kingdom. There is also no denying that men and women from other parts of the world came after them, and that there were countless generations who were already here before them. Until monarchists can reconcile themselves with these facts then the image they hold of Australia is incomplete and false. Holding on to this image doesn't speak to me of pride or confidence in identity, but a reluctance to let go of royal apron strings. Fatima Measham is a Melbourne-based social commentator who contributes regularly to Eureka Street. Her work has also appeared in The Drum, ABC Religion & Ethics, and National Times. She is a recipient of the Wheeler Centre Hot Desk Fellowship in 2013. She blogs at This Is Complicated and tweets as @foomeister. If I were to choose to migrate to another country, it would be because I was prepared to abide by the expectation that live in harmony with the ethos of its dominant culture. I wouldn't be complaining about it as a defect of that nation that it required of me and other immigrants to do so. On the contrary. If this means I'm irreconcilably opposed to some doctrine of multiculturalism, then so be it. I distrust relativism in all its pernicious guises. "The past is fixed, so nothing gets lost in relinquishing the legal and symbolic ties that bind us to England." What isn't visible or celebrated from the past can easily be forgotten - hence statutes, war memorials, holidays such as Labour Day etc. Our visible link to the monarchy reminds people that our institutions were derived from British history - something worth knowing about. The British Empire had the balance pretty well right between tolerating local cultures and drawing the line at intolerable, inhumane practices of subjugate peoples. As exemplified by Sir Charles Napier; "Sir Charles Napier, the British Commander-in-chief in India from 1849 to 1851, signed an agreement with local Hindu leaders that he would respect all their customs, except for the practice of suttee, the incineration of widows. The Hindu leaders protested. Napier replied: "You say that it is your custom to burn widows. Very well. We also have a custom: when men burn a woman alive, we tie a rope around their necks and we hang them. Build your funeral pyre; beside it, my carpenters will build a gallows. You may follow your custom. And then we will follow ours." Apply this mutatis mutandis to Australia today, and we'll have the maxim degree of "multiculturalism" our humane society, based as it is on the natural law and Christian principles, (the one manifestly desired by refugees from other regimes and cultures) can tolerate. HH: "If I were to choose to migrate to another country, it would be because I was prepared to abide by the expectation that live in harmony with the ethos of its dominant culture". The dominant culture was the aboriginal one and why did you not abide by it? I recently visited Jordan, a country with a much-loved monarch, King Abdullah (not sure which number he is). His smiling portrait could be seen everywhere - on the sides of buildings, on posters in the countryside, in hotel lobbies, etc. Our guide in Jordan informed us proudly of Abdullah's education (in the West), his wisdom and benevolence and, importantly, his family (heir included). There was something slightly over the top about it all. I believe Australia's Queen, Elizabeth, would be more than slightly bemused that we still cling to royal apron strings. She's, rightly, a much admired woman on the world stage, and, for one, has my admiration. But Australia needs to grow up and acknowledge we are now a much more multicultural nation than when Menzies uttered his infatuated words about "her passing by". But multiculturalism has not worked. You only need to walk around Bankstown in Sydney's west to see ethnic enclaves. Migrants to Australia come here because they see a better life for themselves. The Australian way is based on the monarchy. Rather than create a society where many cultures exist it would be far better to create an integrated society where many cultures enrich Australian culture. So surely Integration is what is required to achieve this. One Australian culture not many discretecultures each wanting its own space and its own laws. If I were to cite specifics to bolster my opinion I would be accused of being openly racist. This is just one of the problems where one culture is larger than another. Oh that those whose absolutes about heritage were open to some new thinking. I applaud your comments Fatima. They at least represent a fresh approach to the continuing cultural cringe many in our country still adhere to in their rigidity. What a refreshing article with deep understandings. Go, Girl, Go. I declare at the outset my loyalty to the Crown. Your opening statement, obviously factual, implies that such peoples were monarchists. A glance through the UK newspapers of the time will amply show that monarchism was not at all widespread. The matter is not at all simple and is way beyond the images and protocols at citizenship ceremonies. Actually Britain is much more "multicultural" than Australia, Fatima. With all the good and bad this implies. Oh yes, multiculturalism, like any other "ism" can have its flaws, particularly if the term is used un-intelligently, as it sometimes is. I would prefer the phrase "tolerant and cosmopolitan" because that denotes something worth striving for. I am afraid "multicultural" has become a piece of Orwellian Newspeak here. To disagree with it is to automatically brand oneself as "bad", possibly "racist" and to be put in the queue for being branded as such by the politically correct thought police. This degrades national discourse. The British Royal Family (with the possible sad exception of Prince Philip) are actually prime promoters of a multiracial, tolerant Britain. The British heritage of Australia really rests in its legal and political systems. If we have a republic, as in Ireland, I expect things to remain the same. The sort of argument you raise is cliched and old hat. We are moving towards a republic and will eventually have one, I believe. It certainly isn't a top political priority at this stage. Good question, Yorgo. 2 responses: 1. I was born here some time after 1788. But even had I arrived with the early settlers, 2.: There were families and tribes of people living on this continent prior to 1788. They didn't however collectively constitute a country ie, a nation. Hence although these people shared a common culture, broadly speaking, it couldn't be construed as the dominant culture of a unified nation. I remember voting for a republic. Doubt if I could be bothered again. . present system works effectively without impinging on us. Some very interesting comments here; thanks for engaging. For the record, I have no issue with Australia's links to England. That would be constitute a similar denialism to the one I level at monarchists. My point is that such ties becomes a problem when it is used to exclude a significant portion of people who see themselves as Australian, but not English or British. Their experience of personal/national identity is more layered. It might be worth noting that in the US, at least during the 20th century, many Americans confidently saw themselves as 'slashies' with hyphenated identities like Italian-American or Irish-American. We are never one thing but many things. There is no zero-sum where people have to abandon/suppress parts of themselves to be considered legitimately Australian. Although my Irish father refused to stand when our national anthem was God Save the King/Queen, I however, acknowledge that our heritage and much of our way of life came from the UK and its culture. We still have much in common and particular must be made to our royalty and all that it stands for. I hope that we maintain royalty, particularly if is of the character of our present day monarchy. Immigrants like Fatima need to embrace rather than giggle at the photo of the Queen. If I went to live in another country I would not insult that country's royalty, as long as it was a fair and just. And ours is. Not perfect but genuine caring for the people. Only dogs and monarchists lower their heads to another human being. To link the Australian Monarchy to racism is just silly. The Crown guarantees symbolically and in fact the rule of law, and has since the first boat landed. It is the rule of law that stands between us and social anarchy and brutalism, one aspect of which is racism. John Morris: I wasn't being insulting; I was being irreverent. I thought larrikinism was a distinctly Australian trait? "I have no issue with Australia's links to England ... My point is that such ties becomes a problem when it is used to exclude a significant portion of people who see themselves as Australian, but not English or British". No issue with the links yet you want to erase them because, you claim, they exclude. But they don't - the Queen is particularly known as being the Queen of the Commonwealth - you know, of India, Kenya etc? The inheritance of this country can't be obliterated because it isn't the history of wherever your family came from. Eugene: It's interesting that you raise 'rule of law' as a shield against racism because over its history Australia has instituted laws and policies that actually discriminate against race. Section 51 (26) of our Constitution, for instance, was intended to 'regulate the affairs of the people of coloured or inferior races who are in the Commonwealth' (Edmund Barton). This paved the way for the 1901 Immigration Restriction Act and subsequent laws that were applicable only to members of the population who aren't white. Laws evolve, of course, but I disagree that they are naturally a barrier to racism. The fight for native title, the Royal Commission into Aboriginal Deaths in Custody and racial violence (for instance against Indians in Melbourne in 2009) suggest that there are other things at play. HH /06 June:"If I were to choose to migrate to another country, it would be because I was prepared to abide by the expectation that live in harmony with the ethos of its dominant culture. I suggest that if you migrated to another country, it would NOT be BECAUSE you were prepared....... but for the same reasons that migrants come here. If you bought some property, you would want to fix up any short comings it had. "But multiculturalism has not worked." / Geoff/ 07 June It is not multiculturalism that has failed, but people have failed. to give it a Fair Go. Assimilation takes time, but enriches us in the end. It is like saying, "don't put food into your stomach. You won't be able to go swimming for an hour. Give it time. I cannot see a direct relationship between the issues of monarchy and racism. If we become a republic, I expect that the country's mix of social realities - good and bad - will continue. Although I would hope, as I do now, for the sort of national attitudes and values to enable the good to prevail. However, the reason I believe in relinquishing the monarchy is that, as an institution, it represents discrimination on the basis of class, race, religion and until recently, gender. Such discrimination is alien to Australia at it best. Just to inform the conversation and dispel popular myths: the Aboriginal Deaths In Custody found no evidence of racist causes of deaths,. It also found that Aboriginal people in custody do not die there at a greater rate than non-Aboriginal people in custody. So the verdict in that Inquiry certainly points to racism. Not white-on-black racism, but anti-white racism on behalf of the activists who demanded the inquiry and who willfully continue to misrepresent its findings. As a third generation Australian whose great grandparents were Irish, I had to think very carefully before I made my promise to serve the Queen as a guide leader. I think racism is something every one of us is attacked by occasionally. The important thing is that we recognise and fight it. Monarchists are no more racist than Republicans. HH,you didn't answer Yorgo's question, at least as it would apply to the First Fleet. They had no way of knowing that the people they encountered didn't have a culture and language that was uniform across the continent. They should have adopted the language of the people they met. Robert, you're right - I put that clumsily. I should have said "it would be because, among other things, I was prepared" &c. I have difficulty the analogy with buying a property & fixing it up, though. I don't own the country I live in and I'm not the sole and sovereign arbiter as to whether some aspect of the country is a bug or a feature. A better analogy (though all analogies limp) would be renting a property, where I sign the lease accepting the conditions specified by the landlord however much I would prefer them otherwise. The UK, Canada, Australia, New Zealand, Jamaica and PNG all have the British monarch as head of state. (There's variety for you!) Over time the British monarchy has evolved to the point where the monarch has little agreed historical significance and, being unelected, no political power. What matters is the Crown, which is not a person or even an item of headwear, but a group of entities,each of which (in its respective nation or province or state) owns a lot of property, and employs a lot of public servants, but which, despite its extraordinary wealth and power, always does whatever the respective elected government advises it to do. I am not a royalist, and will not be out waving my flag when the reigning monarch next passes by. But I will remain a monarchist until someone can define a better form of government. I have yet to see anything better. I consider one of the favoured alternatives (the one involving an elected head of state) infinitely worse - because of the paralysis that such a system has imposed on the USA. A monarchy has a lot's if similarities to racism and fascism. They all share a the belief that not all humans are equal and that some humans are more important then other. The monarchy also has a belief that a single religion is above all others. The idea of a monarchy is abhorrent to Christianity. The fundament of Christianity is the belief that God has created all humans as equals. No proud Australian can ever bow to a family of inbred Billionaires! That's true Gavan - the First Fleet would not even have known Australia was a continent let alone if there was any nation anywhere on it. My guess is they presumed there wasn't a nation with a central state until one should manifest itself. Turns out they were correct. But had they encountered one, (or maybe the colony of another Western state, or China) who knows, there may well have been a battle, or a treaty dividing up the country. I don't think they considered themselves as immigrants (rightly or wrongly). Whatever, the fact is that I was contemplating migration to a nation-state, as distinguished from the interesting scenario suggested by Yorgo. When I was last in the UK British people, at least those that brought up the topic, tend to regard royalty as a tourist attraction - good for the country because it brings in a lot of tourists. To me royalty is a pompous nonsense without which Australia would not suffer one iota. Welcome Fatima, and may you prosper in Oz. Reading your article, a few things jumped out at me. When you acknowledge QE II as our Head Of State, remember, it's a constitutional, not political term. And it's fair comment that her portrait may have seemed incongruous, but surely you weren't caught unprepared, as her presence graces all of our Aust coins. In respect to the ratio of those of us born o.s., it's always been high. We've always been a nation of immigrants. Now, that we have a very much broader origin of intake, issues of disparity loom much larger. I voted for a republic too, (like Jim,07/06) and share his sentiment. The value of the monarchy is symbolic and removed from politic, race, and religion. The evidence is the disparate membership of the Commonwealth. Colonial? We've been an independent (increasingly) nation since circa Federation, despite political maneuverings for defence purposes. Arguments fail when applying contemporary world views to those of generations past. We're part of a democratic work in progress. Comment is our life-blood, but relativist views beget division. They decay hope of finding points of confluence. That, dear Fatima, is the value of a Constitutional Monarchy. Fatima: I think that under the circumstances you were being insulting. Larrikanism is an Irish trait and I understand that. I think you just don't understand our history. Many come here because we have built a strong free society, based on Christian principles, under a monarchy who is represented here by the Governor General keeping a balance. We are a society that attracts people living under dictatorships or where religions can't live together as we do here in Australia. Some say the Queens is "far away" But there days no one is "far away". It's interesting when you talk of a "layered" America, Fatima. The original colonists in New England and Virginia were English. The French and Spanish had been in other parts of North America prior to that. Even though both sides of my family were, in the mainstream, English they had done service in India prior to coming here, so my earliest memories were not of a unitary European (apart from the then largely unacknowledged Aboriginal and Torres Strait Islander people) society. The memory of some of the ablest Indians - Nehru stood out by a mile amongst many incredibly able - never allowed me to see the Commonwealth as an exclusively white person's club. India had just achieved independence a month before my birth and the head was a president. So, ironically, I was born British and a loyal subject of HM (as much as my parents could speak for me) but in a republic. I find that wryly amusing. The British Heritage in Australia is not one of tolerating local cultures, but of wiping them out. With the early settlers, as well as many massacres, many left out poisoned food and blankets infected with contagious diseases to help wipe out the local aboriginals.The latest example of this was the enactment of the unjust and inhuman policy now called the "Stolen Generation". While the Racial vilification, currently in vogue is less violent, it is a continuation of the same inherited outlook. Great piece, Fatima and you've stirred up some useful debate in the comments to date. What I do find odd in the comments, however, are references to Multiculturalism as an apparent unitary or even universal social form. This is a pretty basic error of fact. Multiculturalism in the UK, the Netherlands or France are distinct from each other and are certainly not mirrored in Australia. In particular, our citizen-based model of Multiculturalism, with a focus on the English language, has been remarkably successful by any measure [economic, cultural, personal] you care to mention. It's not perfect, particularly in its difficulty to come to terms with our indigenous populations, but I'm proud of what we made. We can make it better by a head of state who represents all our traditions by being one of us. I'm a recent immigrant to Oz, from the UK. For me the Republican issue is less about Australia's link to the UK, that historical context will always be there, but about the fact this is the 21st century. Being ruled by unelected aristocrats whether they live here or on the other side of the world is ridiculous in this day and age, surely? My migrant Irish father used to say: "Australia's a wonderful country, but it's wasted on the Australians." He never lost the feeling that he was an alien in an alien land but he always maintained that migrating to Australia with his wife and eight children after World War 2 was the best thing he could have done for his family. Like John Morri's father he wouldn't stand for "God Save The King/Queen". He claimed Lord Castlereagh, British Chief Secretary achieved the Act of Union by blatant bribery and intimidation. He spoke as if it came into force in 1951, not 1 January 1801 when Ireland was joined with Great Britain in the United Kingdom of Great Britain and Ireland. My father regarded the Union as a politcal-forced marriage. He though it somewhat ironic that 200 years later Australia became a united federal nation but only because the British government was convinced that it would in no way impair the unity of the Empire. Enough Australians prefer the Imperialist past so much - even if they have to switch from defence & foreign policy alignment with UK to USA - that they want a UK monarch to long reign over them. i'll fess up - i voted against a republic because i couldn't see anyone i thought half decent to be president (or whatever). How much 'ruling' does the present queen do - including in Australia? And consider the USA and France who wanted republics. All they really wanted to do was get rid of a class entitlement and now hanker after British royalty with it's inherent stability and have a new order of class entitlement........!!!!!!!! Psychologically this stability is better for a nation and people than the instability born of frequent elections for the most flattering candidate. Better the devil you know and have tamed. Fatima wrote "Eugene: It's interesting that you raise 'rule of law' as a shield against racism because over its history Australia has instituted laws and policies that actually discriminate against race. Section 51 (26) of our Constitution, for instance, was intended to 'regulate the affairs of the people of coloured or inferior races who are in the Commonwealth' (Edmund Barton). This paved the way for the 1901 Immigration Restriction Act and subsequent laws that were applicable only to members of the population who aren't white." Fatima, you may need to be informed that the "White Australia Policy" was instituted at the insistence of the Australian Labo(u)r Party and was supported by Australia's early republicans. It was the British government, at the time of Australian federation, who tried to get the first Australian government to roll back their racist immigration policy which was implemented at the insistence of the ALP. The republican standard bearer, the magazine "The Bulletin" had "Australia, for the white man" on its masthead until the 1960's (when it was bought by Frank Packer). Racism, Labor and republicanism have had significant historical links. Our monarchy helps set a better example. In the 200 or so years since colonisation Australia has made significant progress in developing a relatively free, harmonious and over the long run, generally inclusive society. 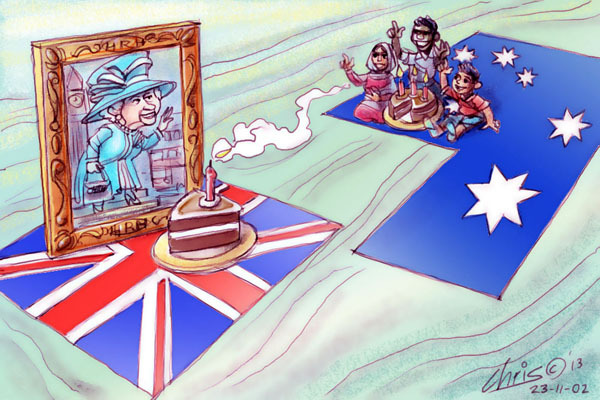 We have not had an urgent need to focus on the why we remained a constitutional monarchy in the past, however, with the natural broadening of our base from births and immigration, Australia will have a less tenuous relationship with its British roots. Our history (good and bad) will remain our history; it’s how we will define our future, and the structural mechanisms that we require to embrace that future that should be the focus of our community’s interest. Fatima, I also feel it odd that Australia should continue to have a constitutional monarch, it was odd when I grew up and it’s even more out of step with Australian society with every day that passes. I’m indebted to your for raising the discussion, it goes to the heart of how Australians see themselves. I have few regrets, yet I greatly hope that Australia reforms its constitutional monarchy structures before I die or I will have another regret to add to the list. First of all the Australian people have labored long and hard to make a tiny country of 20 million people a first world country. We are a people of core values one of which is that we are open to anyone who want to come join this awesome way of life and we respect everyone elses right to live the way they want to live. What annoys people is that these people that we invite into out country and way of life then criticize our way of life (i.e. this article) then demand that we change that way of life to meet their values. Multiculturalism works not as a forces policy but on a subtle level. Look at how the Greeks and Italians used to be discriminated against, and now no one cares, because they rolled up their sleeves, worked with their fellow Australians and fought for this country. Respect is earned not demanded! It's funny how multiculturalism is never championed in the countries Australia's various new citizens come from! Luke wrote "What annoys people is that these people that we invite into out country and way of life then criticize our way of life (i.e. this article) then demand that we change that way of life to meet their values." Actually, Luke, I think that it's not so much the migrants from non-Anglo background who are complaining about our great Constitutional Monarchy, but the "politically correct" republicans who claim to be speaking on their behalf. L. Ossendorp wrote "It's funny how multiculturalism is never championed in the countries Australia's various new citizens come from!" Hmm, L Ossendorp, I am sure the republican lobby don't need the scary truth, thank you very much !! Fatima's piece also invites the question: what is "multiculturalism"? Does it entail accepting female circumcision, polygamy, sharia law, suttee (as I've alluded to above), spearing of certain criminal offenders according to their race, honour killings, and so on? In certain places in the world, an adult man may legally marry a girl of less than 12 years, sometimes as young as 9. Should we allow migrants from these cultures permission for this? In parts of Afghanistan, it's customary for old men to take up with young boys. Is it multicultural to bless this activity? Why, then is there a royal commission into child abuse? What kind of multiculturalism is Fatima defending: the vanilla flavour - lebanese and thai restaurants, or the rich dark chocolate flavour - female circumcision and honour killings? It never ceases to amaze me which E/S articles elicit the most comments from E/S readers - and the quality of the arguments for and against the the thesis of the article. I should get out more. The few people I know who defend Australia's constituional monarchy do it because they love the Queen and the mother country.Their defence is emotional not logical. Those who attack it do so because they do not believe in royal succession by birth and its implied life of privilege. I suppose this is emotional and illogical too. Where multiculturalism comes is not a question I had considered before. I think it would be a good area of research by budding political sociologists. Come to think of it the UK was a multicultural society until the Irish broke away, and the Scots will soon (in next 50 years), and the Welsh won't care as long as they can sing in their valleys and beat the English at Rugby. I do admire the English for the way they have accepted British citizens from former colonial (now Republican) countries. They have not shirked carrying the white man's burden. Noblesse oblige. There is one solitary argument I can think of for untying the knot with the Crown sooner rather than later. According to a UK government report, In 20 years time, if not sooner, Britain will no longer be a Christian society, as the Muslim religion will hold sway. It says, “... the Muslim population in Britain is growing so rapidly that Islam is predicted to overtake Christianity within the next 20 years." The fact is that Christian Britain is simply committing suicide before our very eyes,- and with barely a whimper raised in protest. My position is thoroughly consistent with my stance in favour of retaining ties with a Christian British monarchy and against anything more than vanilla-flavoured "multiculturalism". I would certainly not want to see Australia linked in any way, symbolic or legal, to the head of state of a non-Christian country, let alone one whose official religion results in the persecution and murder of many Christians in the world today. HH's latest posting querying aspects of multiculturalism; "Does it entail accepting female circumcision, polygamy, sharia law, suttee (as I've alluded to above), spearing of certain criminal offenders according to their race, honour killings, and so on?" Raises a very important, if unpopular (amongst the PC) question. Uncle Pat, yes, you should get out more, a lot of the argument for our Constitutional Monarchy relates to practical issues, convention, balance of power and so on. In fact it is the republicans who rely on emotion and their narrow minded notion of identity (and not a little anglophobia in certain quarters) to push the case for a republic. Fatima, you miss the point made also by jim and JohnB that "the Crown" is a very strong international institution that is much more than the its human representatives living in Buck-Pal. Bad Laws are seated by a very separate branch of government i.e. Parliament. The Crown in Australia operates through the Governor General and the courts, and a big worry about populist constitution change is that the Crown`s subtle but real power, usually for good, will be taken by the much cruder political class in one form or another. "The few people I know who defend Australia's constituional (sic) monarchy do it because they love the Queen and the mother country." There are others who may have no blood ties with the UK (Sir David Brand for one) who support the current system because, by and large, it works. The spectacular time it didn't, or didn't seem to, was the Dismissal, where, as far as any decent opinion goes, Kerr did the wrong thing. I think, as with Britain, we are evolving politically. Not every constitutional practice/convention is written down. I think the monarchy is one of those "issues" which, to those violently for or against, are ideological rather than real. I wonder, if Fatima had migrated to Spain, which was one of the long term colonial powers in her native country of the Philipines, whether she would want the Spanish monarchy abolished? Interesting question. Well said Fatima. It is hard to disagree with the sense and logic of your comments. Unfortunately I don’t believe a republic is achievable while the debate remains politicised. It needs bipartisanship and only one coalition leader in recent history supported a republic. It is probably something that will happen incrementally, as changes to our public institutions have happened in the past. A first step might be to formally remove the remaining small and symbolically token British role in the appointment of the Governor-General. It would be recognition of reality if the appointment of the G-G was endorsed by the Commonwealth Parliament. A minor step along the way and of importance only to those who recognise the symbolic change, it could be done without any change to the Constitution, avoiding the need for a referendum. It’s hard to see how anybody could offer a logical argument against that. to EDWARD F: Australia's ties with the monarchy have nothing to do with the current reality of British society and the fact that it may be more multi-cultutral than Australia - it's purely and simply about the institution of the monarchy and the Queens herself who is 'Queen of Australia'. Fatima, your article's closing comment, re the monarchy, is in terms of your feelings of pride, confidence, and identity. Youthful feelings, and some never get over it. Been there. Earlier post- I ideologically voted for the failed Republic bid. Wouldn't repeat, as present set-up has history of 'safe hands'. In fact, our Westminster & monarchy system is, imho, the most representative, stable, humane, and (perhaps) consequently most efficacious system of govt on the planet. Btw - a constitutional monarch, is “above politics” and acts on the advice of the elected head of govt. Although fashionable to bemoan ancestral fault (especially if they're of UK stock) and to reprise the lament broadly and persistently until 'something changes', a current lament, ungraciously applied to previous generations without understanding what they were standing in, results in repetitious history. Your concerns are distant echoes. To move forward culturally, we are required to understand ourselves by standing on our ancestors' shoulders(whatever their origin), and when a better way's discerned, thank them for their successes, forgive them for their fails, and move on with the wisdom gained. Isn't that how I manage to inhabit my own skin, without a crippling guilt? I like what they do in America. You're either Italian-American, African-American, Hispanic, or Asian-American. "to EDWARD F: Australia's ties with the monarchy have nothing to do with the current reality of British society and the fact that it may be more multi-cultutral than Australia - it's purely and simply about the institution of the monarchy and the Queens herself who is 'Queen of Australia'." Well, Aurelius, some of us with English relatives do feel a link with the Old Dart and its wonderful, crazy history. But I can understand people of Irish descent not feeling so, as well as others, like Fatima. You are quite correct, we do operate independently under "The Queen of Australia", effectively represented by the Governor-General. I doubt any decisions get passed up to Buck House. The system - for practical rather than sentimental reasons - works well. As I said, I hope any future change to a republic does not change the system. Two other nations which became republics where the same system operates effectively are Ireland and India. I would hope we would eventually go their way. There is one sufficient and necessary reason why the monarch of Great Britain & Northern Ireland should not be the head of state for Australia. This reason is explained as follows: •	The Westminster Act of Settlement 1701 provides for a prohibition against the monarch of Great Britain and Northern Ireland being of the Catholic faith; •	Discrimination on grounds of race, gender, religion etc is unlawful in Australia, particularly in relation to appointments to public office; •	The “English” Monarch will, for the foreseeable future, be improperly appointed as Monarch of Australia and thus as our Head of State, on the basis of fundamental discrimination. I raise this constitutional “impropriety” as a rational humanist, not in support of any religion, rather in defence of our Australian ethos which, for most of us, shuns the taint of sectarianism, discrimination and elitist inequalities - values of the old world. This impropriety should be addressed by our constitutional lawyers and borne in mind by the People at the next referendum on Australia becoming a republic. Monarchy is by definition that some people by right of birth are born superior to others. That is just fundamentally wrong in a democracy. To anyone who says I should fall in line with the "dominant culture" I say I am an Australian and I can live how I choose, within the bounds of the law, as should anyone in a free society. By the way I am of English and Scottish heritage and I believe the whole point of Australia is resistance to privileged elites telling others how to live their lives. The Queen may very well be a nice lady, but what if she wasn't? I shudder at the idea of King Charles. William may be popular, no surprise with the massive PR machine behind the royals, but who says I should be his "subject"? The current system does that's who. Monarchy is an anachronism bring on a republic I say. Fatima, there are no "legal and symbolic ties that bind us to England." The Australia Acts of 1986 severed the last legal ties and the only symbolic tie is now to the Queen of Australia. There has been no such office as the Queen/King of England for several hundred years. And the Queen of the UK has no power to rule over us. HH... your comment is relativist. You are admitting you would live by the majority standard of your new country. Would you submit yourself and your family to the abuses of caste or Shari'ah law? Isn't there a set of universal standards that transcend all nations? It wont matter in the future, the British society will change in the next coming decades, in which the former subjects of the British Monarch will make up the Majority and probably get rid of the system all together. This country will become a republic in one way or another. Fatima reminds us "Section 51 (26) of our Constitution, for instance, was intended to 'regulate the affairs of the people of coloured or inferior races who are in the Commonwealth' (Edmund Barton). This paved the way for the 1901 Immigration Restriction Act and subsequent laws that were applicable only to members of the population who aren't white. " Just a reminder to you, Fatima, the "white Australia policy" was implemented at the time of Federation at the insistence of the Australian Labo(u)r Party as a condition of it supporting the government of the day. The W.A.P. was promoted by republicans, and the leading pro republican publication "The Bulletin" proclaimed, on its masthead "Australia, for the white man" until it was bought by Sir Frank Packer in the early 60's. It was only at the urgings of the British Government at the time of Federation that the W.A.P laws were watered down from an explicit race test to a "dictation test". From the earliest days of Australian Federation, it was the republicans linked to racist immigration policies, and it was Her Majesty's government in the UK which was against this racism. If you want to take out citizenship in a country you should have respect for all of it's institutions, not just the bits you benefit from and then slag the rest. if you don't like the monarchy there are the States in America, but don't move to Canada, that's part of the monarchy too. Thank you Fatima for that beautifully crafted article. We have Britishness forced upon as. We are drowning in their symbols....We have a British ensign National flag that only came into official use in 1953 but we are told that all Aussie soldiers died under it. Presumable from the Waikato Moari wars onwards. Our money bears the head of the foreign Monarch and then there are all the Royal prefixes...RAAF RSPCA etc.We forget the brutality that came with the British. We overlook our National cringe that came from being descended from their so called dregs. We slink away from their downward looking opinion of us.........If there is anything glorious about our British heritage it has been so badly tainted by their despicably cruel behavior that we should draw a line in the sand and commit everything in the past to one side and the other side should represent a fresh start with our Multicultural and Aboriginal heritage. Becoming a Republic would provide this much needed line in the sand. John Bond claims we have "Britishness forced upon us". This is, of course totally untrue, we are a multicultural nation which inherited its freedoms from the UK parliamentary model. There are social media hate sites in Australia which promote republicanism, and even suggest blood may need to be spilled to achieve this. Pages like that which laud the IRA, hate the British and wish terrible deaths upon British soldiers, these people are the mates and professional colleagues of our own soldiers. It seems a coincidence that there is also a John Bond who frequents such a site on social media. As for the treatment of Aboriginals in this country, it was actually the British monarch who demanded that the Colonial administration respect them and subject the full force of British law upon any colonist who harmed the native inhabitants. We must acknowledge that the harm was not inflicted so much by the British as early Australian colonials. It was against the British policy. This is at odds with John Bond's accusation, but hey, republicans and anglophobes were never known for their commitment to the truth.